Haven’t done your yearly liver cleanse yet? No problem — it’s not too late and a liver cleanse is simple. 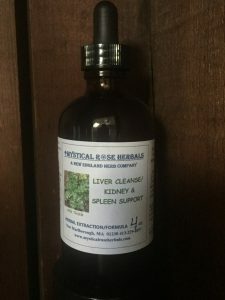 Mystical Rose Herbals has formulated a combination of herbs designed to help cleanse and strengthen the liver in its very important job of removing toxins from the body. To simplify the explanation of how these herbs work to cleanse the liver, think of the original computer game known as “Pac-Man”. Similar to Pac-Man eating up the enemy, the herbs in our formula work synergistically to attract and eliminate exhausted liver cells & they also help the liver dispel toxins. Other herbs in the formula help your liver as it re-generates new, healthy cells. There is no need to do anything stringent while doing the cleanse. No staying home to be near the bathroom or denying yourself foods. Simply take our herbal formula as directed and try to cut down on the consumption of alcohol, dairy products and sugars. The formula will still help your liver if you don’t modify your diet, but the less stress you are adding to the liver’s already-heavy load, especially while it’s cleansing, the better your results will be. Since this is a special offer, you’ll have to e-mail growingtheglow@gmail.com and list the items you’d like. I’ll e-mail you in return and we will connect by phone for your order to be placed. Hurry! This offer will only last for the first week of springtime! It begins today, March 19 and ends at midnight, March 23.